The activity search field is located in the upper right corner. It is represented by a magnifying glass. Click the magnifying glass to open the search box. Enter at least three characters of the word or the numerical value you want to search. The results display below the search box. Click the result to view the Activity Details. You can use Search Preferences to narrow and order the search results. Search Preferences are pre-configured by your administrator. Click the gear icon to view the search preference. 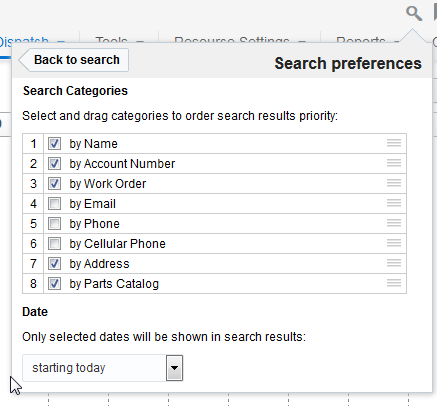 Drag and drop the categories in the list to change the priority of the preferences in the search results. Select the date range for the search results from the drop-down menu. Click Back to search and enter the search value. When you identify an activity or group of activities that are in jeopardy, you can move the activities to another resource or to a bucket for re-assignment at a later time. List view: You can move one activity or multiple activities at once. The application proposes resources that might be a good match for the activity. You can also choose where a new activity will fall in the new resources schedule. Time view: From this view, you can drag an activity from one resource to another. You can move only one activity at a time. The application chooses the best time in the resource’s schedule and automatically moves the job to that time slot. Map view: From this view, you can drag an activity from one resource to another. You can move only one activity at a time. The application chooses the best time in the resource’s schedule and automatically moves the job to that time slot. When you are in the List view, you can move an activity between resources using the Move link in the Hints box. Click List on the Switch View tab. Select the group or bucket that contains the activity. All of the resource’s activities are displayed in the Work Area. Select the activity that you want to move. If you want to move multiple activities at once, select all of the activities now. The Move activity dialog appears. The address of the activity and the work order number displays at the top of the screen. A list of available resources displays to the left. Select the new owner from that list. Choose a resource if you want to assign the activity now. Choose a bucket if you want the activity to be reassign during the next batch assignment. On the right side of the screen, the moved activity displays in the new resource’s route. If the activity displays in green or there is no comment in the Comments column, the new resource is projected to arrive at the customer’s location within the service window. If the activity displays in red or a comment is displayed in the Comments column, the new resource might miss the service window. If other activities are showing in red, the new activity jeopardizes the red activities; the Comments column displays the reason. When activities turn red, another resource may be a better choice. Click OK when you are satisfied with the move. You can move activities between resources in the Time view using drag and drop. Select the resource from the resource tree that you want to move the activity from. The resource’s schedule displays in the work area. Find the activity that you want to move, then drag it onto the new resource. When you drag the activity onto a new resource, the application checks the move against the route to identify potential problems. If the application does not detect any potential problems with the move, the activity is added to the timeline. The application chooses the time slot automatically based on system information. If the application detects a problem, a Move dialog displays an alert. You can either move the activity anyway, or move it to another resource. When you are in Map View, you can move an activity between resources using drag and drop. On the route list on the right side of the screen, select the activity that you want to move. Drag and drop the activity onto the new resource in the Resource Tree. If the box is red, the resource is not available for work. When you drag the activity over the resource, a box appears around the resource’s name. If the box is green, the resource is available to take the job. You might want to move activities from resources back to the bucket for a number of reasons. A resource called in sick and you have already assigned him or her a route. A resource is assigned activities that might place him or her in an overtime situation. An activity is in jeopardy after routing. A resource requested a particular day off, but the calendar does not reflect it as a non-working day and a route has already been assigned to him or her. This topic describes the warning messages that you would encounter while moving activities. Has successor scheduled earlier: This warning appears for a pending activity linked to another activity that should be started after but is scheduled before its estimated completion. Has predecessor scheduled later: This warning appears for a pending activity linked to another activity that should be finished before but is scheduled after its estimated start. Has simultaneous activity: This warning appears for a pending activity linked to another activity that should be started simultaneously but is scheduled to a different time. Overtime alert: This alert notifies you that the estimated completion time of the activity extends beyond the end of a resource’s working day. Work Zone mismatch alert: The application doesn't allow you to assign an activity to a resource without a required work zone. The only exception is when the All check box is selected. In this case, the resource is shown in red and the "Work zone mismatch" alert appears in its hint. Work skill mismatch alert: This alert displays when you move an activity to a resource that does not have the required and preferred qualification level of an activity skill. The only exception is when the All check box is selected. In this case, the resource is shown in red and the "Work skill mismatch" alert appears in its hint. Depending on your settings, the Work skill mismatch alert either prevents you from moving the activity, or gives you the option to move it, or let you cancel the move. Soft Skill mismatch alert: If an activity is to be moved to a resource and a work skill level of this resource is more than (or equal to) the level 'required' to complete this activity, but less than the 'preferred' level, the 'Soft skill mismatch' alert appears. In case of the 'Soft skill mismatch' warning, the resource is not removed from the list of available resources on the Move activity screen (the All check box doesn't affect this behavior). But, it is shown in a different color (blue) than a regular one and the 'Soft skill mismatch' text is shown in its hint message. The 'preferable' skill level is ignored by the 'Self assignment' constraint that is used to filter activities in bucket. In this case the 'required' level is only checked. The 'Soft skill mismatch' warning is shown on attempt to move an activity to a technician with an insufficient 'preferred' skill level. Do not move alert: This alert displays when you try to move an activity type that is not allowed to move between resources. Activity types are configured in the Add activity type page. If an activity has a list of Forbidden resources, the application doesn't allow to assign it to one of these resources. They are not shown in the GUI (regardless of the "All" option). If an activity has a list of Required resources, these resources are only shown in GUI (regardless of the "All" option). If an activity has a list of Preferred resources, these resources are shown in GUI by default. Other resources are returned if the All option is set. In this case such resources are shown in red and the Resource is not preferred message appears for the activity to be moved. The resulting list of the Forbidden resources is a union of the original activity lists. If activities to be moved have the Required resources, the result is an intersection. Activities without the Required list are not processed. If only one of the two activities has the Required list, this list is only used in the restriction. If two activities have the Required lists and these lists are not intersected, all the activities cannot be assigned together to the same resource. If any of the activities has the Required list, the Preferred resources are ignored. The result Preferred list is calculated as an intersection. Activities without the Preferred list are not processed. If only one of two activities has the Preferred list, this list is only used in the restriction. If two activities have the Preferred lists and these lists are not intersected, all the activities cannot be assigned together to the same resource (can be overridden using the All option). While activities are usually added to routes through the routing process, you can manually add an activity to a route. This feature is helpful when you must set aside some time for a resource so that the application does not route any activities during that time. Select a resource from the resource tree. Select Add Activity from the drop-down menu. The Add Activity window displays. Select the activity type from the Activity Type drop-down list. If this activity is an internal activity, the layout of the screen changes. Otherwise, the screen stays the same. Activity Type Select the activity type from the Activity Type drop-down list. Name Enter the customer’s name. Used for customer-facing activities only. Work Order Enter the work order number associated with this activity. Duration Enter the amount of time that the activity lasts. Select the hours and minutes in the respective drop-down lists. Position in Route Choose an option to decide whether this activity is to be performed in a particular order. Not Ordered means that the activity is not ordered, and appears as scheduled/not ordered the lower portion of the time view interface. Ordered means that the activity is displayed on the resource's route. If you specify a time slot, the activity displays in that time slot. Otherwise, it displays as pending at the beginning of the route. Time Slot Select the period of time within which this activity can be started. Access Hours Select the time interval during which the related asset is accessible. Click the pencil icon to select the access hours. Access Schedule Select the days of the week during which the related asset is accessible. Click the pencil icon to define the access schedule. You can schedule two intervals per day. When an activity does not require travel (Calculate travel check box is cleared for the Activity type), the idle time before that activity is considered as travel to the next activity requiring travel in the route. The travel between activities can be split into two (or more) pieces by inserting non-travel activities in between. As a result, in Time View, non-travel activities are placed over the travel time for activities that require travel. Non-travel activity may have a different location when compared to the previous travel-required activity (or provider start location), if a non-travel activity is placed over a travel-required activity. Note: When you place a non-travel activity manually on a time interval that is occupied by the travel bar of a non-movable (for example, due to service window) travel-required activity, it can happen that the travel bar is partially placed before the actual time. In this case, we recommend that you place the non-travel activity to another place in the route. Access Hours define the intervals in which an asset such as a building or equipment is accessible for resources. Access Schedule is the exact time interval and the days on which the asset is accessible. Access Schedule is always set up in the activity time zone and the Access Hours field is calculated in the time zone of the Activity Provider. 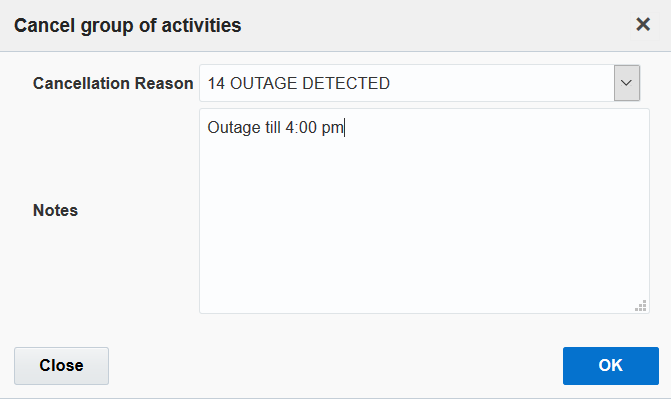 So, the Access Hours field is recalculated every time an activity is scheduled or assigned. This means that the asset is accessible from 8 AM till 12 PM and from 13 PM till 17 PM, Monday to Friday and from 10 AM till 12 PM on Saturday. It I s closed on Sundays. The non-working days are January 1st and May 1st next year. The Access Hours and Access Schedule fields affect routing. When activities are created, routed, and moved, the Access Hours and Access Schedule are taken into consideration. If the access hours and access schedule are not within the activity schedule, the application displays an alert. If the activity is within the Access Schedule, it is assigned to a free slot in the provider queue adjusting the Access Schedule if possible. Otherwise an alert that the asset may not be accessible beyond the defined access hours is shown. Access Hours are recalculated when there is a change in the access schedule or the schedule of the activity. Access Hours are always shown in the provider time zone with respect to overnight settings. For example, if a company has overnight set to 5 hours and no access schedule is defined (that is, 24x7 access), Access Hours is calculated as 05AM-12PM, 12PM-05AM. If tomorrow is the exception date, only the today’s segment is shown (that is, 05AM-12PM). If the exception date is today, only the tomorrow segment is shown (that is, 12PM-05AM). Note: Access Hours are not supported for multi-day activities. They are neither followed for the first segment nor inherited for any multi-day activity segment. Empty schedule (or no schedule at all) and empty exception dates (or no exception dates at all) means no restriction, or 24x7 availability. Empty schedule (or no schedule at all) and some exception dates filled means 24x7 availability except exception dates, and not available on exception dates. Schedule includes all seven days (and may be some exception dates filled) means the availability is defined by the schedule for the given week day, and the asset is not available on exception dates, if any. Schedule includes some, but not all seven days (and may be some exception dates filled) means the availability is defined by the schedule for the given week day, if it is defined. The asset is not available on the week days for which no schedule is defined; also, the asset is not available on exception dates, if any. While Access Schedules are usually added to an activity during the activity creation process, you can manually set an Access Schedule to an activity. Open the Activity details screen for the activity for which you want to add an Access Schedule. Click the pencil next to the Access Schedule field. The Access Schedule editor opens. Choose the days of the week for which you want to set the Access Schedule. Use the "+" and “-” icons to add and delete Access Schedule Intervals. You can set up to two Access Schedule Intervals per day of the week. If multiple days of the week have the same Access Schedule, you can set up the Access Schedule Intervals for all of them at once. To add the days on which the asset is not accessible, click the "+" icon in the Exception Days section and then choose a date in the calendar. To delete an Exception Day, use the "-" icon. The Access Schedule is saved. When you create an activity for one resource that you would like to use for other resources, you can create a mass activity. For example, if all the technicians are required to attend a training, you add a mass activity. Add an activity to a resource as you normally would. 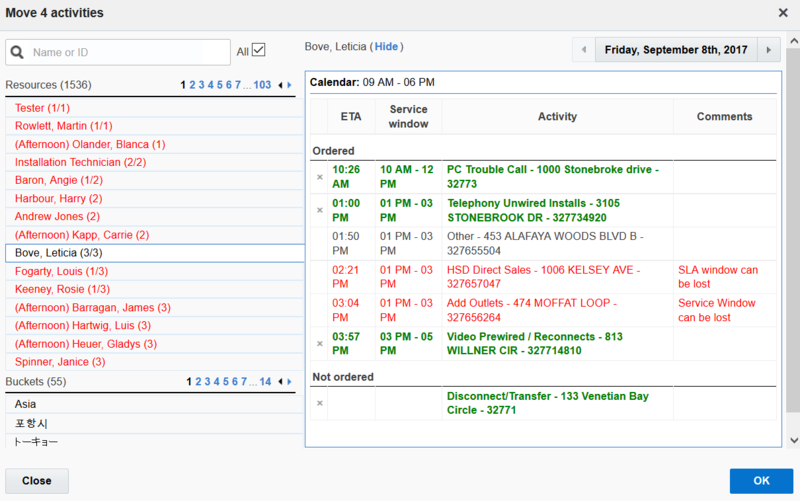 Complete the Activity Notes, Position in Route, Duration, SLA Start, SLA End, and Time Slot fields. The Mass activity check box is displayed only for the activity types for which it is configured. Select the resources that you want to be part of this activity. The activity is assigned to all the selected resources. You can create activities that appear on a resource’s route repeatedly for a specified period of time. Examples of repeating activities include meetings and lunch breaks. In the resource tree, select the resource that you want to assign the repeating activity to. On the next screen, select the Activity Type and the Duration.. Select the Repeating activity check box. Specify how frequently you want the activity to repeat in the Recurrence field. Depending on your selection in the Recurrence field, fill up the Days between occurrences or the Weeks between occurrences fields. Enter a start date for the activity in the From field. Optionally, enter an end date in the To field. If you have selected Repeat weekly, select the day of the week on which you want the activity to repeat. The days displayed here are based on the First day of the week setting in the General section of the Display Configuration screen. You can add a pre-work activity for work that you want to complete in advance of another activity. In the resource tree, click on the resource that you want to assign pre-work to. In the work area, click on the activity that requires pre-work. The Hints box is displayed. Click Prework in the Hints box. The Start Prework dialog box displays. 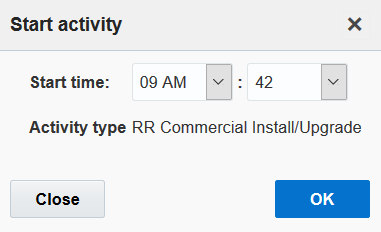 Select the time required to complete the pre-work activity in the Duration field. The duration of the pre-work is the duration you have added here and not the one calculated automatically. The pre-work activity is added to the route. You can set the duration for suspended, reopened, and pre-work activities manually. This helps while estimating the remaining duration—it shows the additional work that is needed to complete the activity. The new pending activity is populated with the value submitted on the Suspend activity screen. Prework is populated with the value submitted on the Start prework screen. The reopened activity is populated with the value submitted on the Reopen activity screen. When you add an activity to a shift, the activity is added to the calendars of all of the resources that have that shift assigned to them. Click Configuration, Work Schedules, Shifts. Click the Activities link in the row of the shift that you want to add the activity to. The Add Activity screen displays. If this activity is an internal activity, the layout of the screen changes. If it is a customer-facing activity, the layout stays the same. Duration Enter the amount of time that the activity lasts. Position in Route-Not Ordered The activity is not ordered, and appears as scheduled/not ordered in the lower portion of the time view interface. Position in Route-Ordered The activity is displayed on the resource's route. If you specify a time slot, the activity displays in that time slot. Otherwise, it displays aspending at the beginning of the route. Activity Notes Enter any notes associated with this activity. Recurrence-Repeats-Daily Apply to schedules such as every other day or every 3rd day. If you select this option, add the frequency of occurrence in the field Days between occurrences. Recurrence-Repeats-Everyday Applies to every day schedules that repeat without exception and without any modification options. Recurrence-Repeats-Weekly Apply calendars that have a regular weekly pattern. Select the days that apply to this shift using the check boxes for the individual days. Indicate the frequency of this pattern weekly by adding a value to the Weeks between occurrences field. Recurrence-Repeats-Yearly Occurs every year from the selected date entered in the From day until the date entered in the To day field. The concept of linking activities applies to a variety of situations in which jobs and resources must be linked and sequenced together over time. When a technician is assigned an activity that takes more than a day to complete, how do you make sure that activity continues to be assigned to him or her until it has been completed? A group of workers may be assigned to a series of activities related in such a way that the first one must be completed before the second can be started, and so on. What’s the most efficient way to keep that big job moving efficiently? And what about a necessary break in a task that creates a corresponding gap in a technician’s schedule? What can you do to make sure your resources remain productive while “waiting for the paint to dry”? When activities are related serially over time or when routing relationships cause a break in the schedule, linking activities can be used to manage the link and restore efficiency. The first step in linking activities is to create link types that correspond to the four linking relationships represented graphically on the New Link template. The next is to use those link types to link actual activities for Routing. Oracle Field Service Cloud can link two activities together based on the information you send to the application using APIs. Activity link types identify the way that two or more activities can be linked together and specify the constraints, if any, that should be placed on assigning and scheduling resources. Before you can link activities, you must create activity link types. Activity link types are generic. You can reuse a link type to link various activities over time. In addition to the type of linkage (start-to-finish, etc.) consider more specific characteristics such as the interval between activities and any rules you want to make about assigning and scheduling those activities. Regular link type: This link type places the first activity in the schedule before the second activity. Reverse link type: This link type places the second activity in the schedule before the first activity. The links that you create – both regular and reverse – will be available in the drop-down list that displays when you link activities. Start-to-Start: Second activity starts after the first has been started. Simultaneous: Both activities start at the same time. Related: The relationship between these two activities is not sequential. Because each of these link types generates two different linking options — regular and reverse — your linkage "library" could begin with at least 8 different link types, further differentiated by the amount of time between activities and any assignment and scheduling constraints — such as same technician over two days, different technicians on the same day that you want to place on them. Before you can link activities, you must create activity link types. 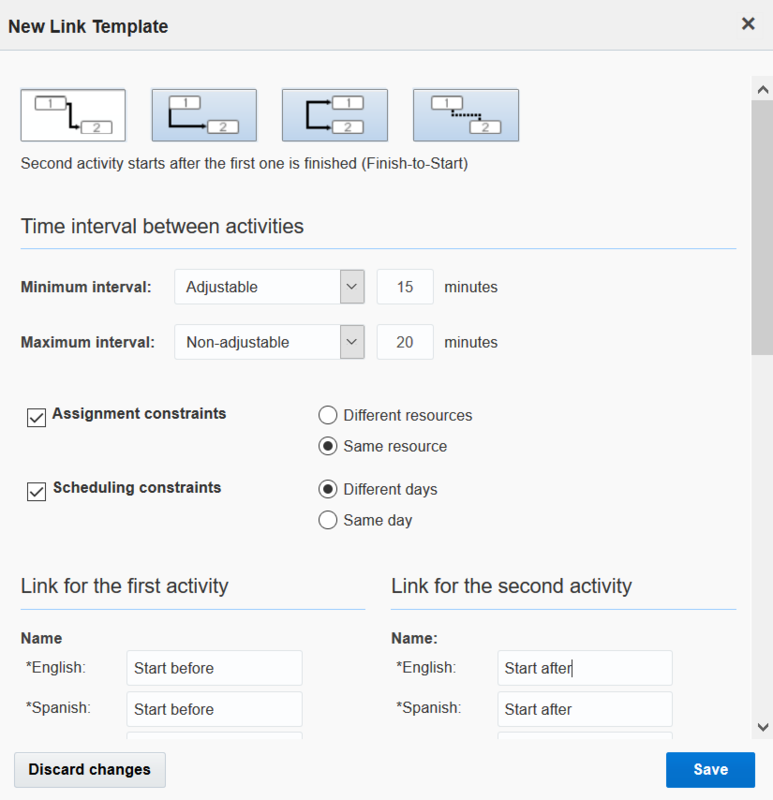 Activity link types define how the activities are linked for example, the minimum interval between activities, the constraints for scheduling activities, constraints for assigning activities, and so on. Click Configuration > Link Templates. The Link Templates screen appears. The New Link Template screen displays. Select the graphic at the top of the screen that represents the way that you want to link the two activities. Enter the Minimal Interval of time between the two activities in minutes (min). Enter the Maximal Interval of time between the two activities. For example, if the minimal interval is five minutes, the maximal might be ten or more minutes. Enter any Assignment Constraints that you want to place on assignments. There are two options: Different resources requires that the linked activities be assigned to two different resources. Same resource requires that both activities be assigned to the same resource. Enter any Scheduling Constraints that you want to place on the days for which the activities are scheduled. There are two options: Different Days requires the activities to be scheduled for two different days. Same day requires they be scheduled for the same day. Enter a Name and a Label for this link type. The name is what is displayed in the Web interface. The label is used by external systems when they submit information through the API. Check the Active box in the Status field to make this link type available for use. You can link activities to make sure that they occur in a certain order when the routing is run. Activities you might want to link include a trip to the depot to pick up a piece of non-standard inventory prior to an installation or a job that involves multiple workers performing related tasks in a certain sequence. You can automatically link activities using the Inbound API. Link Types must be created before you can link activities. Select the resource that has the first activity assigned to it. Select the first activity that you want to link. Click Details to view the activity details. Click the Links tab at the bottom of the Activity details screen. The Add link window displays. Select the type of link that you want to use from the drop-down list, that is, Start after. Use the next field to search for the activity that you want to link to the first. If an error message displays, hover over the error icon to review the error messages and make changes as necessary. Error messages may relate to the maximum and minimum intervals required by the link type you have chosen or to other scheduling and assignment constraints. You may have to create a new link type. You can only cancel pending activities. In the resource tree, select the resource that you want to cancel the activity for. In the list view, select the activity or activities that you want to cancel. Click Cancel in the blue box above the list. In the Cancel Activity box, complete all required fields and select a Cancellation Reason from the drop-down list. The fields on this dialog vary based on the way the application is configured for your organization. The activity is removed from the time view, but still appears in the list view with a small block of time. For the application to monitor delivery in real time and respond to updates, a resource must activate his or her queue, or route. In the event that the resource forgets to activate his or her queue on time, you can activate the queue and reset the actual time for the resource. Select the appropriate resource from the resource tree. Click the gear icon and click Activate Route. The Activate route dialog appears. Change the time to the actual time that the resource started the queue. Typically, resources mark activities as started when they begin to perform the activities. As a dispatcher, you can start an activity on behalf of a resource if necessary. Caution: You must start activities on time in the application. 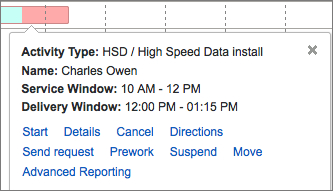 Oracle Field Service Cloud relies on past activity data to project activity durations, travel times, and distances. If activities are not started on time, these projections are not accurate and routing is not optimized. The route that the activity is assigned to is activated. All previous ordered activities are completed, suspended, marked not done, or cancelled. In the resource tree, select the resource that you want to start the activity for. Click on the activity to view the hints box. The Start activity dialog appears. The start time defaults to the current time. If necessary, change the time. Once the activity starts, it appears in green status in all views. If the resource cannot complete the activity by the estimated end time, then they can add time to the activity through their mobile interface. If necessary, you can add time to the activity on behalf of the resource. You can add time only to an activity that is started. Select the resource in the Resource Tree. From List or Time tab, locate the activity in Started status that you want to add time to. Click Adjust time in the Hint. 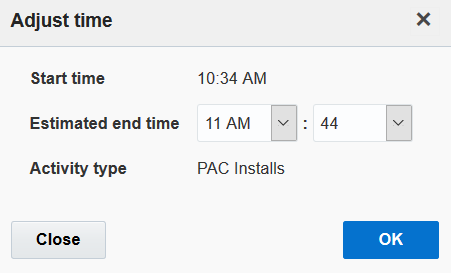 In the Adjust time dialog, enter the new estimated end time. The application automatically recalculates the activities that follow according to these changes. Typically, resources mark activities as complete when they complete the actual activities. If necessary, you can mark the activity as complete on behalf of the resource. In the resource tree, select the resource that you want to complete the activity for. From the Time tab or List tab, select the actions button and then click Complete. The End activity dialog appears. The fields on this dialog vary based on the way the application is configured for your organization. At a minimum, complete the required fields (those with an asterisk *). When resources must return to activities at a later time and they do not want to cancel the activity, they can suspend the activity. If necessary, you can suspend the activity on the resource’s behalf. Suspending an activity captures the time that a resource has already spent working on it and creates a new, duplicate activity that can be started at any time throughout the day. Note: You can suspend only started or pending activities. On the Time tab, click on the activity that you want to suspend. In the Hints box, click Suspend. Select the time required to complete the remaining part of the activity in the Duration field. Click OK. The duration of the pending activity is the duration you have added here and not the one calculated automatically. When you suspend a started activity, a duplicate of the original activity is created in a suspended status. If you suspend a pending activity, it is converted to a not-ordered pending activity. A duplicate of the activity is created only when you start working on it. In the Work Area, the current portion of the activity closes. 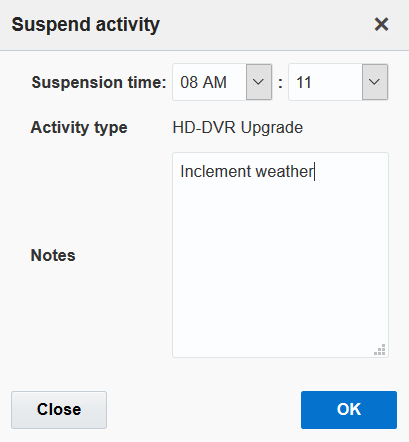 It displays as a suspended activity (scheduled, but not ordered) in the lower half of the screen. When resources discover that they cannot complete activities, they mark the activity as not-done status. If necessary, you can change the status for them. Unlike suspend, which creates a duplicate copy of the activity to be completed by the technician the same day, the not done status is considered to be a final status, like completed. For example: the customer was not home, or the customer asked to reschedule. From any view, click Actions. The Close as Not Done dialog box appears. Select Not Done in the drop-down list. Select a Not Done Reason. At the end of their shifts, resources must deactivate their routes. You can deactivate the route on behalf of the resource if necessary. In the resource tree, select the resource that you want to deactivate the route for. The Deactivate queue dialog appears. Enter the necessary information and then click OK. The Group Operations feature makes it easy to perform the same action on multiple activities simultaneously. 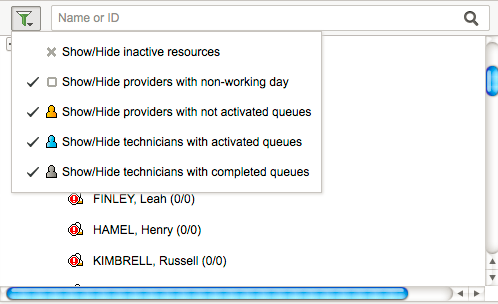 For example, this feature could be used when a resource calls in after routing has run for the day. The activities for that day can be placed back into the bucket all at once to be routed to other resources. When a group of activities is at risk, you can move it to avoid the service window being missed. You must work in List view. Select the resource or bucket from the Resource Tree. Select multiple activities in the first column of the Work Area or select the Select All check box. Click Move from the top of the Work Area. To see a list of all resources and buckets, select the check box next to All. The Move dialog appears, and the screen populates with resources and buckets available. The items to be moved will display in the selected resource’s/bucket’s route. If moving the activities will cause either them or subsequent activities on the route to jeopardize their service window, the activities display in red. Such activities also have appropriate comments in the Comments column. If moving the activities does not cause any jeopardy, then the activities appear in green. If the desired resource or bucket is visible, select it. If not, then search for the resource or bucket from the Find box. Once you are satisfied with the proposed changes, click OK to complete the move. You can make changes to multiple activities at once. The Group Change option must be enabled for your user type. Select a resource or bucket from the resource tree. Select the items that you would like to change. Click Change link from the top of the Work Area. 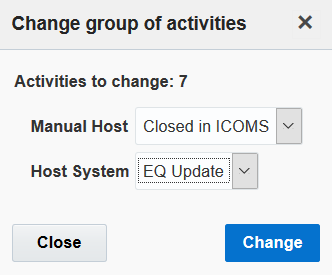 The Change group of activities dialog displays a list of parameters that you can edit. Once you have confirmed your changes, click OK. If a customer has canceled a site visit, you can cancel the activities that was assigned to the team that was scheduled to visit the customer. Select the items that you want to cancel. Ensure that all items can be cancelled. Only pending and started items can be cancelled. Click Cancel from the top of the Work Area. The Cancel group of activities dialog appears. 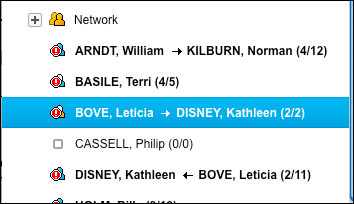 Use the drop-down menu to select a Cancellation Reason and then add any pertinent notes. Click OK to complete the cancellation of the selected items. Cancelling a repeating activity or teamwork will only cancel it for the current day. Multi-day activities are activities that can be carried over to the next day. They are normal activities that are split into segments and managed individually. In other words, amulti-day activity comprises a set of activities, each representing a single-day task with definite start and end times. You create a multi-day activity based on the total duration of the activity, number of segments, and the duration for each segment. You must also identify the route or the sequence of the segments in the activity. Multi-day activities can be represented graphically and can be assigned to one or multiple resources. These activities also respond to events that occur as the activity progresses. Technicians receive segments of multi-day activities in their routes and can handle them as single-day activities. Multi-day activities are represented as separate bars on the Time view, can be assigned to buckets or technicians, and support time monitoring and status changes. A multi-day activity comprises a set of activities, each representing a single-day task with definite start and end times. You can assign each single-day activity to a different resource. A single-day activity is also known as a segment. Further, you can start and complete a segment or the entire activity. Before you create a multi-day activity, you must create a multi-day activity type. Multi-day activities progress through the same lifecycle as single-day activities – they are created in the pending status, then can be started, canceled or deleted. A started multi-day activity can be completed or set to not done. A canceled, completed or not-done activity can be reopened if necessary. However, as opposed to single-day activities, actions with scheduled multi-day activities are performed at the level of their segments and may either affect only the current segment or involve the entire activity. For non-scheduled activities having no segments, there is the Cancel action which always affects the entire non-scheduled activity. If a segment of a multi-day activity is longer than four hours, its bar is shown with a break in the list view. Non-scheduled multi-day activities are displayed in the similar manner. Note: Single day activities that are longer than four hours are also shown as a bar with a break. This helps to find all segments of the same multi-day activity quickly, especially when they are assigned to different resources. Non-scheduled multi-day activities are the activities that do not have the performance date specified in a route. A multi-day activity can be created in or moved to the non-scheduled pool of a bucket or a route. When you create a non-scheduled activity, the segments are not generated and only the total duration of the multi-day activity is displayed. If a multi-day activity is moved from the scheduled to non-scheduled pool, all the segments are deleted and the activity is merged into a single entity with a definite duration. If the position of an activity is not defined in a route, it is referred to as a not-ordered activity. If you enable Support of not-ordered, a multi-day activity is marked as not-ordered. A default segment is created on the first day of the activity even if the time duration is not specified. This default segment with minimal duration always remains even after modification so that you can monitor the not-ordered activity in the current route. The duration of the not-ordered multi-day activity segment is a value in between Minimal duration of a single segment parameter and Maximal total duration of segments created for a particular day parameter. The actual duration of a segment can also be equal to the available time period in the route. 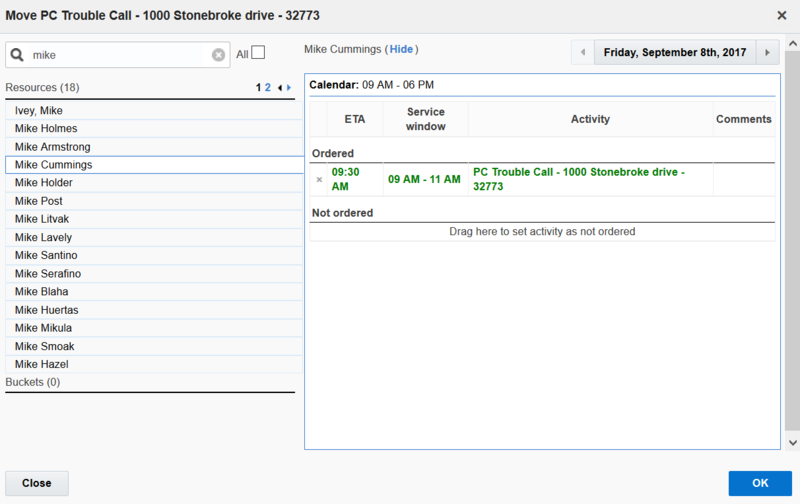 This setup allows you to perform not-ordered multi-day activities in between other activities. This section includes the specifications for multi-day activities in areas such as property inheritance, activity search, travel time calculation, work zone and work skill support, inventory and required inventory support, capacity management and routing, and so on. In a pending multi-day activity all fields and custom properties are inherited by the segments from the multi-day activity with the exception of the Duration and Position in route fields which are determined for each segment. If a file property is added to a multi-day activity, the content of such property is not cloned to each segment. Instead, reference to the file property is created for segments. If a new file is uploaded to a started segment, the new File ID will be used only for the segment for which it was created. All other segments will refer to the file uploaded to the entire activity, if any. All existing segments of a scheduled multi-day activity. The activity itself is not returned. There is no visual difference between multi-day activities and single-day activities in the list of search results. If the Support of work zones, Support of work skills, and Support of preferred resources features are enabled for the multi-day activity type, they will be determined for all activities of such type. The work zone, work skills, and preferred resources are determined for the entire multi-day activity and retrieved for each segment on demand. The same work zone, the set of work skills, and the same preferred resources are applied to all segments. For multi-day activities with the ‘Calculate travel’ option enabled travel time is calculated for all segments of a multi-day activity. The calculation logic and usage for statistical purposes is the same as for single-day activities. Any inventory added to a multi-day activity is added for the entire activity. Each segment shows the same set of inventory. Any inventory action (install, deinstall, add, and so on) can only be performed on a specific segment. However, these operations will update the inventory list for the entire multi-day activity and, consequently, the inventory list shown for all other segments. Similarly, any required inventory is also assigned to the multi-day activity rather than its segments. The same required inventory is shown for all segments. All required inventory actions are performed for the multi-day activity and update the required inventory list for all segments. Note: Required inventory added to a multi-day activity sets no assignment restrictions. No alerts are shown when the resource’s inventory does not match the required inventory. Multi-day activities are handled as "internal" activities. Multi-day activities cannot be booked with the "get_capacity" function. This function doesn't calculate capacity categories for such activities. Multi-day activities are not included in the Used quota values on the Quota view. Instead, they are added to Other activities. The link data displayed for a particular segment relates to the entire multi-day activity. Adding or deleting a link for a segment actually adds or deletes a link for the entire activity. The Nearby Activities function does not show either multi-day activities or their segments. Therefore, none of them can be found among the Nearby Activities search results. You can retrieve history from both, a non-scheduled multi-day activity and a segment of a scheduled multi-day activity. The history for a non-scheduled activity contains records for the activity itself. The history for a segment contains records for the current segment and for the entire activity. Some actions relate both, the multi-day activity and one of its segments. In this case, the history contains two records, the one for the entire activity marked with (multi-day activity) in the Action column. Daily Extract stores multi-day activities and their segments together with activities of other types and extracts them into the Activity Fields file. Multi-day activities can be identified by their type—‘multiday_activity’ for the entire multi-day activity and ‘multiday_activity_segment’ for individual segments of a multi-day activity. If a multi-day is still in progress, each daily extraction contains the completed segments of the activity in the current day routes. As soon as the entire activity is completed, the extracted file contains the data of both, the individual segments and the entire multi-day activity. You can segment a complex task to create a multi-day activity. A multi-day activity can be created in a pool of a bucket or a route. You can also mark the activity as scheduled activity or non-scheduled activity once created. Before you create a multi-day activity, ensure that you have created an activity type for multi-day activities. Click Add Activity from a route or a bucket. The Add Activity page appears. 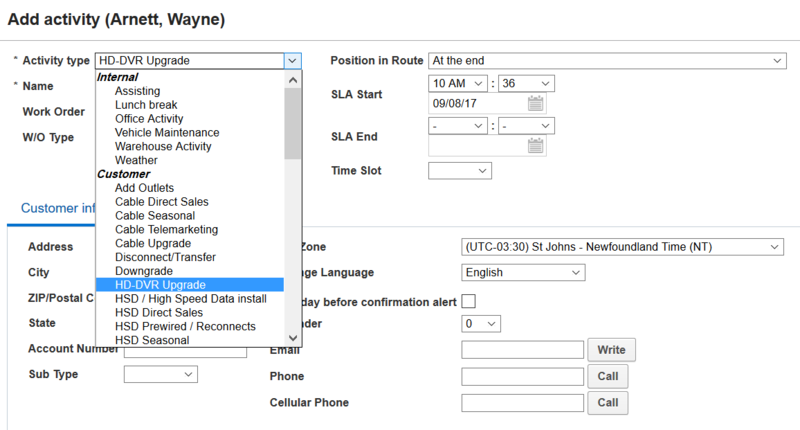 Select the order of the activity from the Position in Route drop-own list. This option is available only when you create a multi-day activity in a route. Enter the customer Name for the customer facing activities. Enter the Duration of the activity. The duration of a multi-day activity can be set in between 5 minutes and 999 hours. Enter the Work Order number associated with the activity. Select the type of work order from the W/O Type drop-down list. Enter the appropriate SLA start and SLA end dates. Customer Info Indicates the address of the customer. Service Info Indicates the service details of the activity. Equipment Indicates inventory details necessary for the activity. Preferred Resources Indicates the resource requirements and preferences. Messages Shows the log of all the outbound messages pertaining to the activity. History Denotes the history of the activity. Links Denotes the links between the associated activities and dependencies. The multi-day activity is created in the pending status. Depending on the requirement, you can create a single activity, mass activity, or a repeating activity type of a segment. Click Actions in the list view. The Add Activity window opens. Select the Activity Type and enter the Duration and Time to complete for the segment. The segment added appears under the Links tab. In List view of the multi-day activity, a hint pops open for each segment denoting the status, duration, time, and details. You can also start, complete, cancel, reopen and view the directions of a segment. When a multi-day activity is created, its segments are generated automatically. In generating the segments the functionality takes into account various constraints ensuring efficient tasks distribution and compliance with the customer agreements. When a scheduled multi-day activity is assigned to a certain route, its segments are always generated starting from the date of the route. The first segment is always inserted on the day which the activity is scheduled, regardless of whether a corresponding free time interval is available in the route. The minimum duration of a single segment is always observed. If the route for a particular day has no time interval for a minimal single segment, no segment is created for that day, except the first segment of a scheduled multi-day activity which is always created on the selected date. If for the period of 31 days after the creation of the last assigned segment there is no available interval for assigning the remaining duration of the multi-day activity, the remaining duration is moved to the non-scheduled pool of the same resource making the activity partially scheduled. The service window constraint applies only to the first segment of a multi-day activity in the route. When creating a multi-day activity, the application should observe the service window constraint not only for the multi-day activity but also for other activities in the route. However, the less time that remains from ETA to the service window end, the higher is the probability of service window overdue. To reduce the overdue probability, the application reserves 20% of the service window scheduling the activity only to the first 80% of the service window interval. In addition to the service window reservation, the Service Window Warning parameter defined on the Display screen also controls the service window compliance. If the SLA start corresponds to the day on which the multi-day activity is started, this value is used as the minimum ETA for the first created segment of such activity. No multi-day activity segments are created on non-working days. If a non-working calendar has been assigned to the resource after the multi-day activity creation, the segment assigned to that day is not moved automatically. An alert is generated indicating that a manual action is required. Such behavior is intended to prevent unnecessary segment changes or removals when the calendar is changed only temporarily. On-call calendar is ignored in multi-day activity segment creation. When a multi-day activity is non-scheduled, no segments are created. Segments will be created as soon as the activity is scheduled to a particular day. Multi-day activities display the hint pop-up dialog, similar to single-day activities. Hint appears on both, the scheduled and the non-scheduled segments. The hint content is defined in the Visible hint columns for activities context layout. At the same time, hints of multi-day activities or their segments always contain theMulti-day status property regardless of the context layout settings. Segments of scheduled, pending, complete, and not done activities: The hit contains the activity status, the total duration of the multi-day activity and the total number of segments into which he multi-day activity is split. The Duration field shows the duration of the selected segment. Canceled activities: The hint contains the activity status (canceled). Segments of started activities: The hint contains the activity status, the total duration of the multi-day activity, the activity progress in percent, the number of segments in a final status in the total number of segments. The Duration field shows the duration of the selected segment. The progress value is calculated as the combined duration of all finished segments divided by the total duration of the multi-day activity. In this case, the total number of segments does not include canceled and deleted segments. Non-scheduled activities: The hint contains the activity status (pending) and the total duration of the multi-day activity with the non-scheduled duration shown separately. As opposed to scheduled activity segments, the Duration field shows the duration of the entire multi-day activity. The hint also contains the number of segments created out of the non-scheduled Multi-day activity, which for fully non-scheduled activities is always ‘0’. Partially-scheduled activities and their segments: When a part of a non-scheduled multi-day activity has been moved to the route(s) generating one or more segments and the rest of the multi-day activity remains in the non-scheduled pool, the hints of both the scheduled segments and the non-scheduled part of the multi-day activity contain the activity status and the total duration of the multi-day activity with the non-scheduled duration shown separately. The hint also contains the number of segments created out of the non-scheduled multi-day activity. The Duration field of a scheduled segment shows the duration of such segment, while the Duration field of the non-scheduled part of the activity shows the total activity duration. Multi-day activity hints appear on Time, List, and Map views containing the same information. A multi-day activity has an own status which in some cases may be different from the status of its segments. The status of a multi-day activity is determined by the activity progress and by the statuses of its segments. A multi-day activity is created in the pending status and remains pending if all its segments are in the pending, cancelled or deleted status, or if it has no segments at all (non-scheduled multi-day activities). As soon as one of the segments is started, the status is changed to started. When one or more segments of a multi-day activity are in the completed or not done status, and there are no other started or pending segments, the activity has the completed status. A multi-day activity is in the completed or not done status when one or more segments of a multi-day activity are in the completed or not done status, respectively, and there are no other started or pending segments. A multi-day activity changes its status to cancelled when all its segments have been canceled or when the entire activity is canceled together with one of the segments. At the same time no segments must be in the completed or not done status. If the canceled activity is in a not-activated route, it can also be deleted. For an activity to be deleted, it must have no canceled segments or segments in activated routes. You can assign an activity to the route of the bucket and reassign it to the resource route. When a scheduled multi-day activity is created in a bucket, it is split into segments and mapped for capacity management processing. When the activity is created in a bucket, only one segment is created for each day. The duration of such segment is equal to the value of the Maximal total duration of segments created parameter of the activity. If a multi-day activity is created in a bucket that doesn’t have a working calendar, the first segment is created on the day the activity is created. The duration of such segment is equal to the value of the Maximal total duration of segments created for a particular day of the activity. No other segment is created and the rest of the multi-day activity is marked as non-scheduled. Segments are not created for the non-working days in the bucket. You can see the overview of a multi-day activity in the Time, List, and Map views. To view or edit the details of the activity, you must go to the Activity details screen. When you access the activity details from a started segment or a segment in a final status, the Activity details screen shows data of the current segment only. When you update the details of a started segment only the current segment is updated. The list of activities is displayed for the selected bucket. Click the bucket or resource for which you want to view the activities. Hover over the multi-day activity for which you want to view the details. All segments of the activity are highlighted by diagonal lines. This highlighting helps you find the segments quickly, especially when they are assigned to different resources. The hint pop-up box appears. Position in route The position of the current segment. You can move the segment to a different position by selecting it from the drop-down menu. Duration The duration of the current segment. However, there is always the Time to complete field displaying the duration of the entire multi-day activity. Note: When you update the details of a segment, the details of the entire multi-day activity and other pending segments are updated. If a multi-day activity has any segments in the past, their details are not updated, though. The minimal allowed value of the Time to complete field is determined as the greater of the minimal duration of a single segment and the total duration of the existing started segments. The Time to complete value can be changed, if necessary. This is the only way to change the duration of the entire multi-day activity. The activity details are updated. The Details screen of a multi-day activity shows all its segments in one place. The Links tab contains a list of all the segments. The list is organized as a table showing the segment date, status, start time and duration. The list also contains the Details and List view links allowing you to quickly switch between the details of activity segments and find them on the List View. Note: For multi-day activities, the Links tab is always visible, regardless of the Support of links feature setting. You start a multi-day activity the same way you start a single-day activity. However, the multi-day activity starts when its first pending status segment is started. Further, you can start each segment separately. Select the first pending segment of the multi-day activity. Click Start in the list view. The Start activity screen opens indicating that the multi-day activity started and the status of the entire activity changes from pending to started. Note: The Multi-day Status field always shows the status of the entire multi-day activity. When the first segment of a multi-day activity is started, the Multi-day status field of all remaining segments also displays Started, regardless of the actual status of the specific segment. You can mark an activity status as completed at the end of a task. Activities or segments that are started but cannot be completed due to various reasons can be marked as not-done. You can complete or incomplete the entire activity or a single segment of the activity. When the time to complete and the last segment complete simultaneously, then the activity is marked Complete. If the segment completes before the time to complete, the remaining duration is moved to non-scheduled pool and the activity is marked as Started. The Multi-day activity is finished check box is selected by default for the last segment of the activity. This check box is disabled for all other segments. If you complete an entire activity with a segment, which is not the last segment, all the remaining segments are deleted and the activity is marked complete/not done. Further, all subsequent segments are deleted from the route(s). You can mark either a segment or an entire activity as complete. For a segment to be marked as complete, it must be in Started status. You can also mark an activity as complete, after you finish the last segment of the activity. You can also mark the incomplete activity as not done. Open the activity in the List view. Select the segment with Start status and click End from the hint. The End Segment window appears. Enter the time that is remaining to complete the activity, in the Time to complete field. Initially, the Time to complete value is calculated according to the following formula: multi-day activity duration – duration of finished segments – (current time – start time). The time to complete can be adjusted simultaneously with completing a segment. Note: The Time to complete value is automatically calculated only when the form is opened and is not automatically adjusted with the adjustment of the segment completion time (the Ending at field). This prevents unnecessary automatic changes to other segments of a multi-day activity. Select the Multi-day activity is finished check box. The Multi-day activity status drop-down list appears. Select the final status for the activity from the Multi-day activity status drop-down menu. Complete: Denotes that the activity is complete. Not Done: Denotes that the activity is incomplete due to various reasons. The selected segment along with the entire activity is marked as complete/ not done. The final status of a segment may be different from the final status of the entire multi-day activity. For example, you can close a segment as Not done while the activity will have the Completed status, and vice versa. To set an activity as Not done, follow the steps described in Step 4. You can cancel a pending multi-day activity or a pending segment within the activity. Select the segment or the activity that you wish to cancel in List view. The Cancel Segment window opens for a segment and Cancel Activity window opens for a non-scheduled activity. If you wish to cancel the entire activity with the current segment, then select the Multi-day activity is finished check box. If you select this check box, the Time to complete field is hidden. You can delete an activity that has all its segments in the Pending status in an inactive route, and has no canceled segments. In such case the Cancel Segment window displays the Multi-day activity status field to select the final status of the activity as deleted or canceled. 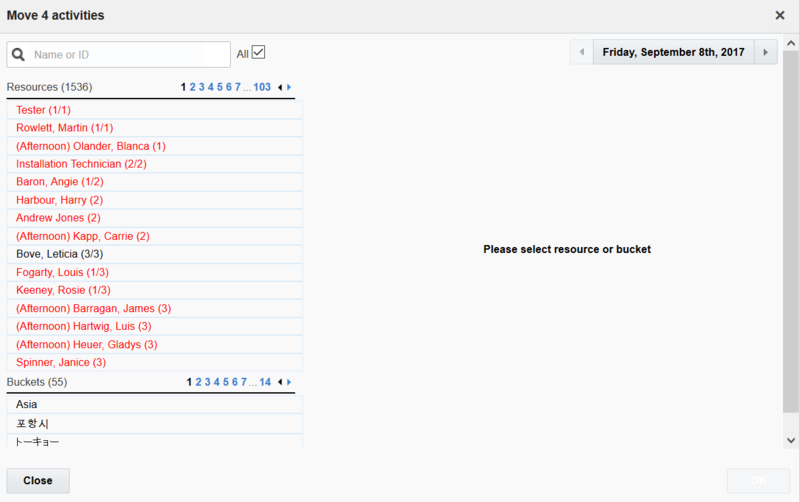 Select the Multi-day activity status from the drop-down list and click OK. Deleted Denotes that the activity is deleted. Cancelled Denotes that the activity is cancelled. If the multi-day activity has at least one segment in start status, the remaining pending segments can only be canceled individually. You must first change the started segment to a final status. You also cannot cancel the entire activity. You can adjust the time to complete to cancel / delete the activity. The activity is marked canceled/ deleted. Adjust the Time to complete and click OK. If you cancel the last segment of an activity and the time to complete expires simultaneously, then the activity is marked complete. When the segment is cancelled before the completion of the time to complete, the remaining duration is moved to non-scheduled pool and the activity is marked as canceled. The Multi-day activity is finished check box is marked by default for the last segment of the activity. If you want to cancel the entire activity along with the current segment, which is not the last segment of the activity, all the segments are merged to form a single entity and is marked as canceled. If you cancel only the current segment and not select the Multi-day activity is finished check box, the Cancel segment window shows the Time to complete field with the remaining duration of the activity. When a multi-day activity has a started segment, all subsequent pending segments can only be canceled individually. In this case there is no option in the Cancel activity window to cancel the entire activity. The selected segment can be canceled and, optionally, deleted, by changing the Time to complete field, if needed. Follow the same procedure to cancel a non-scheduled multi-day activity. This activity is created as a single entity without splitting into segments, and can, therefore, be canceled only entirely. You can reopen a canceled segment or a cancelled activity or an activity in the final status. You cannot reopen a single segment in a final status. When you reopen a multi-day activity, the same activity is recreated. The reopened multi-day activity will have the same list of segments in its Links tab as well as other attributes. Select the activity that you wish to reopen. Click Reopen multi-day activity in the Activity details screen. Or, click Reopen multi-day activity from the hint. The Reopen activity window opens. Enter Time to complete to define the duration of the reopened activity. The field is pre-filled with the value of the minimal duration of a single segment defined for the activity type. This duration can be different from the initial activity duration. The reopened activity is created with in the same route and allocated to the same resource associated with the initial activity. If the initial activity is not started, the reopened activity is created in the Pending status. If the activity is started, the reopened activity is created in the Started status. You can move and reschedule all the segments or a single segment of an activity to a specific date. You can drag and drop an activity or a segment on a resource or route to move the activity. The duration on the hint allows you to estimate if the destination time slot is enough to move the activity or segment. For the scheduled multi-day activities, the hint displays the duration of the particular segment and for the non-scheduled activities the duration of the entire activity is displayed. You can drag-and-drop activities to perform all these actions, and some others, in the Activities View. The Move link is not supported for multi-day activities. When you drag an activity or a segment, a hint prompts you to drop the activity on a resource or route to which you want to move the activity. The hint also contains the activity or segment duration, so that the you can estimate if the destination time slot is enough to move the activity or segment. For scheduled multi-day activities, the hint shows the duration of the particular segment, while for non-scheduled activities it shows the duration of the entire activity. When a scheduled activity is moved to another resource or rescheduled to another date, all its pending segments are deleted and recreated in the new location. The recreated activity segments can have different destination route, date, and duration from the initial activity. In addition, number of segments may also differ. Select the multi-day activity or segment that you wish to move. Drag and drop the multi-day activity to another resource /date. The Move multi-day window opens. Move only selected segment Only the segment dragged is moved to the new destination. Move all segments assigned to this resource for date All the segments that are assigned to the resource on the same date are moved. Move all segments starting from date All the remaining segments of the multi-day activity on and after the selected date are moved. When only one segment of the multi-day activity is assigned on a selected date, the move all segments assigned to this resource for date option is not available. When the selected segment is the last in the multi-day activity and is the only segment assigned on the selected date, only move only selected segment is available. The segments are moved. If the move action violates any of the applied constraints, a warning message appears indicating the violation. When you drag-and drop a multi-day activity from a non-scheduled pool to the route of a resource, an activity with its segments is generated according to the route constraints. You can also move an activity from a route to the non-scheduled pool. Select the activity that you wish to move. Drag and drop the multi-day activity to another route. Generate all segments starting from date Moves the entire activity and creates its segments from the current date. The resulting segments are placed into the resource's route according to the constraints. Create segments only for date Segments are generated only for the current date according to the constraints and the remaining part of the multi-day activity is left in the non-scheduled pool. The sequence of segments in a multi-day activity is not important. If one or more segments are moved to different resources, the segments (activities) are performed independently. If a multi-day activity is created in a bucket, it can be moved to the route of a resource based on the time available in the route. If the destination route has no available time intervals, one segment of the minimal duration set for the activity type is still created. Select the multi-day activity that you want to move. Segments are created only for the current date. The remaining multi-day activity is left in the bucket. A segment with minimal duration is inserted if the destination route does not have available time interval for that day. One or more feasible segments are inserted if the time is available and the segments with higher duration are removed from the bucket. The remaining duration of the multi-day activity is redistributed in the bucket, creating new segments if necessary. For example, if a seven-hour segment is moved from a bucket to a resource and the resource’s route only has time for one 1–hour segment and one 2–hour segment, the remaining four hours of the activity will be added to the last segment in the bucket or created as a new segment. No multi-day activity segments remain in the bucket for the current date. A segment of a multi-day activity can be moved to a different place in the same route. Move only selected segment The selected segment is moved to a different position in the route. Recreate all segments in this route Segments are reordered and the duration and the number of segments are recalculated in the route. If you select Recreate all segments in this route, the segments are automatically calculated and adjusted as per the constraints. The segments are reordered in the route. When the Activities screen is set to the List View, you can select the segments of scheduled multi-day activities for group actions together with other activities in the route. In this case only Change and Cancel actions are available. When you select only multi-day activity segments, the Move action is not shown. Open the multi-day activity in the List view and select the activities you want to move. If you select other activities with multi-day activity segments, the Move link is shown, but the move action is applicable only to the other activities. Further, the count of activities denotes the number of other activities. The hint appears denoting the number of segments available to change and cancel and the other activities to move. Change When you apply this option to one or more pending segments, the details of the entire multi-day activity are updated. If you change the segment with start status, the updates are visible only to the selected segment. If you change a pending segment, the entire activity is updated. Cancel You can cancel only the pending segment and not the entire activity. You also cannot update the time to complete the segment when you cancel the segments. When you cancel a group of activities, the route is not recalculated until all activities selected for the operation are cancelled. This reduces the time required for the operation and increases the system performance. The selected segments are changed / cancelled. You can adjust the duration of activities and the individual segments that comprise them. The duration of the complete task is set up while creating a multi-day activity. You must adjust the Time to complete value to adjust the activity and segment durations. When you first create a scheduled multi-day activity, it is automatically split into segments. The duration of each segment is calculated according to the constraints and the actual time available in the route of the resource. You can adjust the activity and segment duration based on these constraints, however, the purpose, procedure and results of such adjustments may be different. The duration of a scheduled multi-day activity is the sum of durations of all its segments. You can adjust the time to complete the activity to manage its duration. Select the scheduled activity and open the Activity Details page from a route or a bucket. The Time to complete value is the total duration of the multi-day activity minus the duration of the already finished segments. The Duration and Time to Complete fields appear. Cancel a multi-day activity segment If only one segment of a multi-day activity is canceled, the total activity duration can be changed simultaneously. Complete a multi-day activity segment If only one segment of a multi-day activity is canceled, the total activity duration can be changed simultaneously. Set a multi-day activity segment 'not done' If only one segment of a multi-day activity is set not-done, the total activity duration can be changed simultaneously. Reopen a multi-day activity If a multi-day activity in a final status is reopened, its duration can be changed at the same time. The activity duration is changed. Note: If you change the Time to complete value, the remaining pending segments are recalculated; the number of segments and their duration may be changed. Although activity segments are initially generated automatically, you can change their parameters manually. Such manual changes are preserved during further automatic recalculations. Also, you change a segment manually in a route that contains other segments of the same multi-day activity, such other segments will also be protected against automatic recalculations. Select the segment started in an activity and click the Adjust Time link. Start a segment If the route contains pending segments of the same multi-day activity, they are not adjusted automatically with the time adjusted to the started segment. This action causes recalculation of the activity segments in the routes of next days. The routes may be adjusted so that the total duration of the multi-day activity is preserved. If all remaining segments of the multi-day activity are located in today's route, and the started segment adjustment causes their total duration to exceed the total duration of the activity, you must increase the duration of the activity accordingly. Cancel a segment If one of the segments of a multi-day activity is canceled, no other segment in the same route is affected. The total duration of the multi-day activity (the Time to complete) can be changed, though. Mark the segment as cancel/not done You can adjust the duration of a specific canceled /not done segment. The adjusted duration of a segment does not modify other segment duration. The duration is adjusted according to the new settings and, consequently, may change the total number of segments. However, any changes made to the segments manually are preserved even if the activity type parameters change. The segment duration is adjusted. If you change the basic parameters of the activity type such as the Minimal duration of a single segment and Maximal total duration of segments created for a particular day, the segments of the existing activities of such type are recalculated. The duration of such activities is adjusted according to the new settings, and this in turn may change the total number of segments. However, any changes made to the segments manually are preserved even if the activity type parameters change. Teamwork is a feature that allows a resource or group of resources to assist each other either on a specific job or on an on-going basis. team leader – This is the resource who is being assisted. assistant – The resource who is assisting. In the assistant’s work order queue, time will be reserved and marked as assisting (the team leader). The arrow points to the person who is in need of assistance. Use the Assign to Team link in the Actions menu. Use the Assign to team link in the hints box. Drag and drop into the resource tree. Both the team leader and individual resources can start and complete teamwork on their mobile device. If any resources cannot do this, the team leader can do it for them. 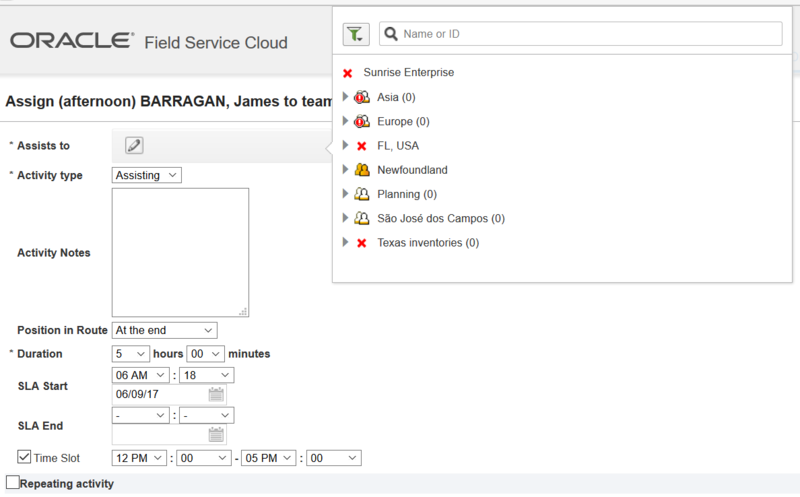 The assistant can open a teamwork activity and see the route of the team leader in Oracle Field Service Mobility Cloud Service on the day of the teamwork. The assistant can reschedule a scheduled regular activity assigned to the team leader within the day(s) of teamwork, but can't reschedule it to other day(s) when there is no teamwork. The assistant can't reschedule a scheduled regular activity assigned to the team leader to a non-scheduled pool. If the assistant tries to perform actions that are not permitted with a scheduled regular activity assigned to the team leader, the message, "You are not authorized to move the activity" appears. Select the Resource who will be the assistant from the Resource Tree. The Assign (assists) dialog box appears. Select the pencil icon to display the Resource Tree. Use desired filters if necessary. Type the resource name or ID in the search field. Assists to: Select the pencil to search for your desired resource. Start typing the name of the resource in the search field that the selected resource will be assisting (the Team Leader). the application will search and bring up resource options as you are typing. Or you can click the name of the resource in the resource tree and it will fill in the Assists to field. Position in Route: Select the position this activity will fall in the route. You can select beginning of route, in between other scheduled activities; end of route, or as a not ordered activity. Duration: Enter the length of time this teamwork assignment will last by using the drop down menus for hours and minutes. Time Slot: Time Slot refers to a time window that this teamwork needs to happen within. The default is all day, but you can change to reflect a specific time slot. Click the Time Slot check box to select the time slot you want this activity to be performed. Activity type: Select the teamwork Activity Type from the drop down list. Repeating Activity: If this is repeating Teamwork, select the box next to Repeating activity to open repeat options. You can indicate if this Teamwork should repeat daily or weekly and which days/weeks on which it should repeat. The Assists to field populates. Once you have completed all required information, click OK or Close to Cancel. Teamwork appears in the Assistant’s work queue, and the Resource Tree indicates that the Team Leader is being assisted. You can assign teamwork using multiple ways and drag and drop is one of the ways. Be aware that there are two roles involved in teamwork—Team Leader and Assistant. The second way to assign Teamwork is to drag and drop one Resource to another. In the Resource Tree, select the Resource who will be the assistant. Drag the Assistant to the Resource who will be the Team Leader. When dragging over names in the Resource Tree, hints may appear to indicate whether or not the selected Resource can participate in Teamwork. Once the Team Leader is selected (visible by a green box appearing around the Resource’s name) drop the Assistant onto the Team Leader. The Teamwork assignment box appears.